The topic of how a gymnast should land continues to be controversial for many coaches, gymnasts, and judges. I’m not the first person to bring this up, as my good friend Dr. Josh Eldridge as well as Rick McCharles have written on this up before. I’m just going to weigh in my opinion on the matter. 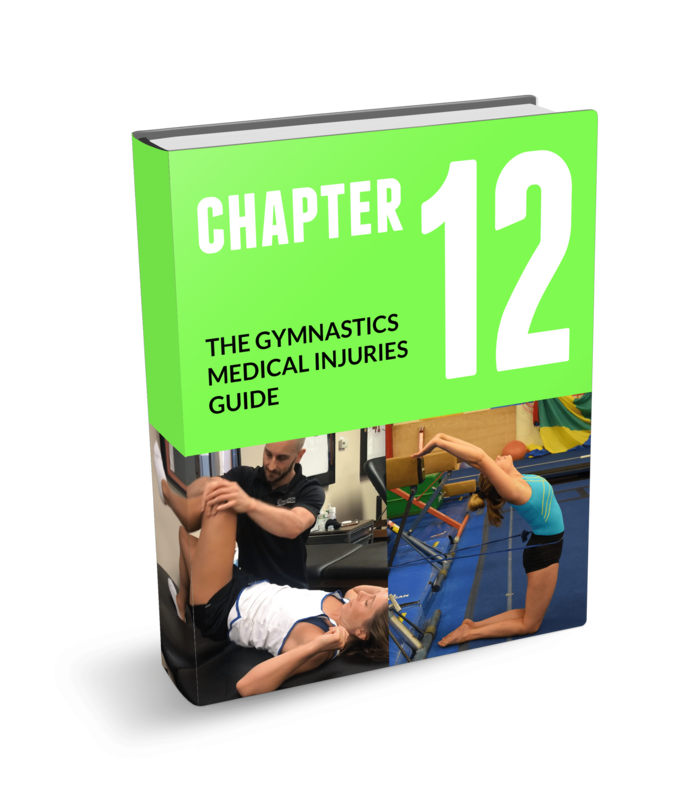 Before I share more, remember that I recently released an entire e-book on Gymnastics Injuries, and another on Gymnastics Strength and Conditoning, that you can download here. The main reason for this is the growing concern for significant injuries like ACL tears, patellar tendinopathy, Osgood Schlatters Disease, anterior impact based ankle pain, Achilles injuries, and Sever’s Disease. If you would like to read up on some more research related to this, you can check out the articles here, here, here, here, and here. 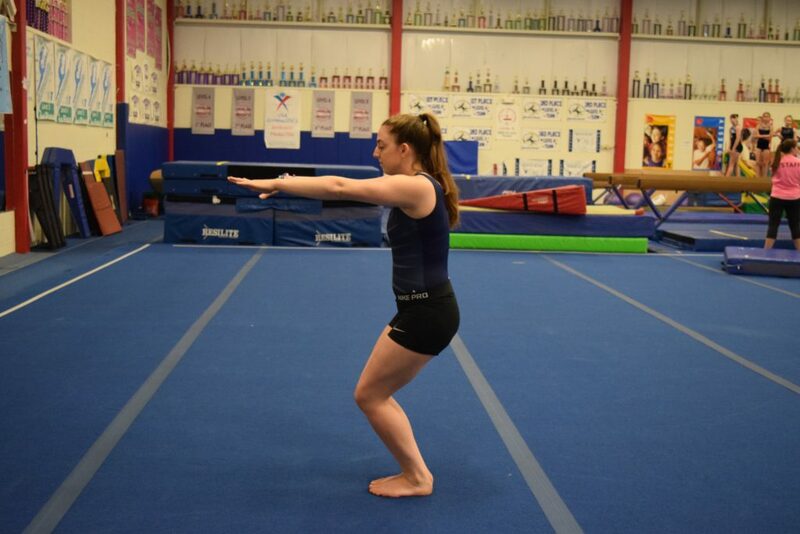 Remember Dr. Sand’s work has suggested the forces acting on the gymnast can be as high as 17x body weight, and gymnasts take likely thousands of impact reps over a month of training and competitive season. It is due to this that we must stress proper landing mechanics from a young age, to make sure they not only know how to control the forces but also have sound motor patterns that are built. This way, when they mature to weigh more and start doing much higher level skills, they will continue to safely land. Along with injury based aspects, the traditionally taught gymnastics landing style is also less effective to stick skills. During the more ideal pattern noted above the glutes and other hip musculature can more optimally control the forces eccentrically during landings. A perfect example is this Instagram post I put up following Simone Biles sticking her Amanar at worlds. Note the fantastic squat position. She also has very strong legs, but that chat is for another time. If it’s good enough for her, I think it’s probably good for everyone. There are many, many other cases I could included for generally sticking more times with a squat versus being forced to take steps when feet together and hips are tucked under. There will always be outliers, but this seems to be the general trend. One common issue that comes up with gymnasts I treat or when we teach seminars is that of “flipping shape” versus “landing position”. Coaches and athletes have to understand that the ideal flip shape for tight double backs or regular front tucks is not necessarily the best way to land and dissipate high force. Take these videos for example. One of our level 6 athletes had some serious issues in landing her front tuck pass, and also sometimes complained of back pain when she landed a lot this way. I had her do it on Tumble Trak after seeing it on the floor. As you can see she lands in a typical gymnastics flip shape. This is what we want to avoid due to the points above. I then had her do a squat jump and land a few times, then try to do a front tuck and mimic the proper squat position. Given her feet are a bit too wide, you can see it helped her landing position and also she reported it was much more comfortable. This is just one example of a simple front tuck, but think about high force double pike, huge high bar dismount, or yurchenko full landings, done over thousands of reps through a yearly season. It adds up quick on a growing, skeletally immature athlete who may not have gone through the growth process for leg / torso strength yet. Now I am quite aware that gymnasts all have different anatomy that will make their squat different from one athlete to another, that there may not be a “perfect” way to land, and that there are an infinite amount of movement variables related to motor variability that will almost never make the gymnast be able to land in this ideal manner. What I’m trying to explain is that we want the athletes to use more of a hip and muscular dominant strategy that will more ideally dissipate the high forces through angular displacement. Ideally we want to shift the stress away from the passive ligamentous and bony structures to more muscular and active based structures across the entire kinetic chain. I feel this is crucial to make dents in both the overuse and acute injury rates that sadly very high in gymnastics. I know many coaches get concerned about score deductions, but from what I have read/heard from national judges and elite coaches it is that feet hip is allowed as long as it is a reasonable distance. Beam is one situation where we clearly don’t want “feet hip-width apart”, but the athlete can still use hip based strategies for their dismounts. I also know that connected bounding tumbling is completely different technically than absorbing a high force skill/dismount, and there will be large differences in landing technique here. There will also inevitably be short and off landings we can’t avoid, but for me I think this is where the role of a well designed and periodized strength program comes into play. I think there is a way to properly prepare tissues for low landings, and I certainly think lower extremity joints should have the capacity to handle varying force angles, but in general I feel we need to utilize proper squatting form in the very high load gymnastics skill scenarios. Definitely interested in receiving get your 10 page pdf. Good article! There will be no change in lower level athletes until it becomes preferred technique by the judges. Unfortunately we live and die by the rewards given. It is difficult to justify taking a lower score when all they have to do put their feet together. To see this become common place, it has to be rewarded. Back in my days when I was training professionally if your feet are apart you get points down that’s why that way of landing was thought but also I never rimeber to tuck my hip in in landing hip was a bit out. Now days the gymnast do so much harder impact on landing because the element are so much harder but about the feet apart I’m not sure if they take point out and if they do it’s nothing to do with the science it’s simply because between 1st and second place can be only 0.10 which you can loose if you land with feet apart so if they still take point out your feet should be together. How does this technique work with gymnastics in dancing? Would a squat landing look as nice as legs together in a dance combination that has front or back handspring’s or back tucks?